Could pop-up LED replace pop-up flash – another step towards cameras catering to videography over stills? When looking for the best DSLR or best mirrorless camera, the question of whether or not it has a pop-up flash isn't generally a deciding factor. If you're a videographer, however, having a pop-up LED could play a huge part in your decision – and that's something you may soon have to consider, if Canon's latest patent is anything to go by. 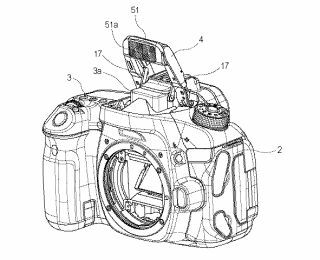 Spotted by Canon News, Japanese patent application JP,2019-056787,A describes "a lighting system and relates to a lighting system with the pop-up function using especially LED as a light source… The type which has what is called a pop-up function for which the lighting system built in a camera moves the type with which the light-emitting part was fixed to the camera body". Of course, the big issue would be power. LED lights have a much lower output than flash, and the power of pop-up flash units is already quite low, so an LED that small may struggle to produce a worthwhile amount of light unless you're working close up in very dim conditions. Of course, for vloggers filming themselves indoors, that may be all that's required. There's also the issue of heat dissipation – for an LED to produce a lot of power, or to remain active for a significant period of time, it generates a lot of heat. This is a problem that the patent specifically answers, though, with a radiation substrate that takes advantage of the fact that the pop-up mechanism effectively separates the unit from the camera body. "Therefore, the lighting system excellent in heat dissipation can be provided, without impairing design."